Enjoy an escape to the Casa Aloes bordering the Quinta das Mil Flores, (which is a property of 3 hectares surrounded by pine woods and orchards), on the outskirts of the little hamlet of Sobreiro in the hills above the village of Pedrogao Grande and offers a pleasant balance between calm seclusion and easy accessibility. In the Leiria region of Central Portugal, by the new A13 expressway between Tomar and Coimbra, the Quinta is 1 h40 by car northeast of Lisboa and 1 h40 hours southeast of Porto 35 min. from Coimbra). As the Quinta is in the nearly exact geographical center of Portugal, Pombal and Serta are close by, and it is an easy drive to visit UNESCO sites such as Alcobaca, Batalha, Tomar, Coimbra and Fatima, and also Nazare village and ocean beach, Obidos, Busaco, etc. The concept of all the Quinta development is ecologically oriented. In function of the possibilities of each existing or future building, many ecological techniques of insulation, materials and natural energy resources have been used : a vegetalized roof, geothermie, and/or solar panels . 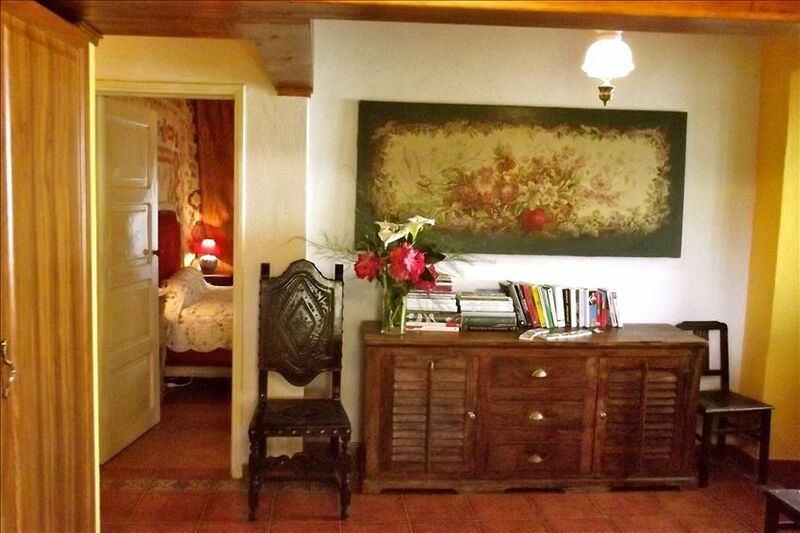 Newly renovated, the Casa Aloes will sleep 5 persons, in 2 bedrooms, (child's bed available on request), each bedroom with a standard double bed (one polychrome early 20th century, one Louis XVI). There is a bathroom with an antique porcelain bathtub with a shower and a copper washbasin, both with bronze faucets, and a separate WC. For starry summer nights or afternoon lounging there is a roofed and tented "Adventure" bedroom with a single bed on the Casa's "Plaid Garden" of Iris and lavender. The house has a-salon-dining room with TV (80 channels) and a completely furnished kitchen, WIFI, built-in wall oven, refrigerator, cooking surface, sink, dishwasher, and cupboards, micro-onde oven, electric tea pot, toaster, dishes, glassware, cutlery, kitchen utensils, pots and pans, electric heating, Dreamland dual controlled English heated bed pads, kitchen, bed and bath linens. Furnishings are charming and eclectic, gathered from my travels around the world. A washer and dryer are also available in another building, and the house has its own private secure interior parking. CD's, tapes, DVDs and books in French, English, and Portuguese, are available for guests' enjoyment. The Casa is non-smoking, but guests may nip out into the garden to puff away. The Quinta is about a 10 minute drive to the lake beach of the Zezere River dam, and the same to the charming island river beach in Mosteiro, and about a half hour to the specially amenaged river beach at Castanheira de Pera. The area is included in the scenic Route de Xisto, and offers many pleasant hiking and biking paths and routes. Pedrogao Grande, 10 minutes away has an indoor tennis, exercise gymnasium, many shops, cafés, banks, post office, 2 small supermarkets, a weekly Monday morning general market fair, hairdressers, restaurants and church, etc. There is also a large Saturday morning market nearby in the town of Figuiero dos Vinhos. For those who prefer to avoid shopping trips on vacation, Sobreiro hamlet benefits from daily bread and pastry truck delivery and the weekly passage of fresh fish and meat vendors, so you can lean back and relax, enjoy the fresh, pine-scented air, the birds singing and watch the butterflies fly by. The Quinta das Mil Flores and the Casa Aloes have appeared on Portuguese national television (SIC TV), in several Portuguese and French newspaper and web news articles. The Quinta is also featured in the beautiful art book in French "Jardins d'histoire and sans histoire de la Comtesse de La Panouse", raconté à Bettina de Cosnac, Editions Monelle Hayot, France. We also have our own olive oil, grape juice, home-made fruit liqueurs, jams, jellies, preserves, and chutneys. On request, by reservation, Fatima Antunes can home cook a delicious typical portuguese lunch or dinner . Guests may also enjoy an original guided themed tour and expo : "The Making of a Garden" on the existing and ongoing creations and ecological goals of the Quinta. INFORMATION AND RESERVATIONS IN ENGLISH OR FRENCH, PLEASE TELEPHONE: 00336 2951 1116. Celebrating my 74th birthday this April, I am semi-retired and divide my time between my occupations in France and Portugal. Our adult children now manage the companies created on family estates and others in France by my husband, Paul, Comte de La Panouse. In 1968, Paul created in the Thoiry estate near Paris, the first reserve for exotic animals in liberty and Thoiry Participations SA has since created or manages the 2 Family castles and gardens and 4 conservation reserves in France. An Americain from Wayzata, Minnesota, I myself worked for several years in fashion, first in NYC then in Europe until I met and married my husband. I subsequently worked as commercial director and then developpement for Thoiry, and at restoring the Thoiry and Colombier castles and creating gardens in both estates. I am still on the companies' board of directors and continue to occupy myself with Special Projects, international press, TV and tourist markets. My major interests are gardens, architecture, decoration, classical music, fado, asian culture and travel. For more information, see my Facebook pages and the Thoiry, Colombier, Thorenc, and Peaugres Safari websites. After a severe attack of arthritis in Thoiry, I decided I needed to find a warmer climate off season than the Paris region offered. Searching internet for a country that would offer the solution to my climatic and budgetary needs, I saw a photo of the original Quinta cottage, landscape and orange trees. On site, I felt immediately a certain well being due to the buildings and landscapes 'geographic' influence (land sloping down from the road to the east up again to pine wooded hills, with another hill sloping down from north and levelling off to the south towards the view of blue mountains. While waiting for building permission to enlargen the old house, in the interests of ecology and an experience in durable developpement, I have created themed gardens and converted a garage and tool shed into a garden Folly where I now stay. Then, last year, my neighbor down the road decided to sell his cottage and garden, so I bought it, and have just finished the renovation for vacation rental. I love the wild rolling green hills of central Portugal and the many wonderful monuments from Portugal's remarquable historic past, the blend of mauresque and baroque architecture is fascinating. Above all, I find the Portuguese to be among the most hospitable people in Europe with a highly developped sense of solidarity and generousity. I am also impressed by the number of Portuguese for whom poetry is a living art, and who, from all walks of life, are writing and reading it. I love the village atmosphere, eating on my terrace in the warm January sun, the delicious food and although I don't drink much, my husband tells me some of the wines are quite good as well. Luxurious red marble tilde bathroom with antique porcelain bathtub and copper washbasin. Farmers and Goods Markets: in Pedrògão Grande (4km) on Mondays, in Campelos (4km) on Sundays, in Pedrògão Pequeno (5km) on Sundays. Cabril`s Dam lake: amazing water surface, very easy to access and enjoy. Beautiful views of pine forests, gardens, rolling green hills and blue mountains in the distance. Kitchen, dining and TV living space. Large selection of novels, historical , decoration and garden books in french, english and portuguese. On the Zezere River Dam Lake. Pool and spa in nearby villages. The concept of all the Quinta development is ecologically oriented. In function of the possibilities of each existing or future building, many ecological techniques of insulation, materials and natural energy resources have been used : a vegetalized roof, geothermie, and/or solar panels . Chinese Poets' Pavilion The garden is entirely bio and guests may buy on site freshly picked bio herbs, fruit and vegetables, (including many rare varieties not commonly available even in specialized grocery stores.) We also have our own olive oil, grape juice, home-made fruit liqueurs, jams, jellies, preserves, and chutneys. Grape & olive harvest events. Gay Friendly Portuguesa O conceito de todo o desenvolvimento da Quinta é ecologicamente orientado. Em função das possibilidades de cada edifício existente ou futuro, muitas técnicas ecológicas de isolamento, materiais e recursos energéticos naturais foram utilizados. Loja Bio com vegetais e frutas dos Jardins da Quinta. "Gay Friendly"
Casa Aloes has a private garden and parking. Access also available to the beautiful "Jardins de la Quinta das Mil Flores" (see Facebook). Special VIP theme tour (The making of a garden); grape harvests in October; olive harvest and making of olive oil in November. A physical therapist or an esthetician may be booked to come to the Casa Aloes for guests. Hairdresser in the nearby village of Pedrogao Grande. A 'table d'hôte' in the gardens or meal preparation in the Casa. Um fisioterapeuta ou um esteticista pode ser reservado para vir para o Aloes Casa para os hóspedes. A 'table d'hôte 'nos jardins ou a preparação da refeição na Casa. No smoking inside the house Sorry no pets allowed to avoid disturbing local wildlife. Thank you. Guests are expected to respect the garden - If fruits or vegetables from the bio kitchen garden, please ask Madame Antunes who will be happy to harvest them for you for a supplementary fee. On arrival, you will be asked to give a portuguese or french bank check for a 500€ security deposit - The check will be given back to you on leaving if no damages.